Bergama is great--I fall in love with the town. Three principal tourist sites exist: the ruins of Akropol, on a hillside 1000 feet above the city, the remains of Askiepion, closer to the town center, and the Red Hall, one of the seven original churches of Christianity. My personal preference during my two-day visit, however, was simply wandering the back streets of the town. On my last afternoon I spent a few hours in an old antique shop, buying a few Roman coins. It was dusk when I stepped back onto the deserted side street. I stopped just to take in the silence and watch the last vestiges of the setting sun give way to the evening stars. The solitary toll of an approaching cowbell drew my attention away from the sky. 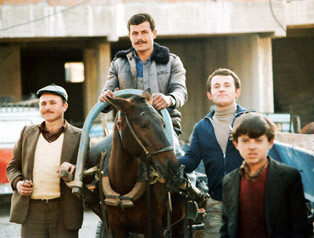 Around the corner came an old Turkish man on a donkey; tethered behind the donkey was a towering camel, overloaded with boxes, blankets, everything. Ignoring me, the small procession continued around the next corner, the clanging bell fading with the last of the light. I was spellbound. He was coming into town from the east. My map didn't even show a road there. I had thought that I was an adventure traveler, but here was a reminder that I was only scraping the surface of this great country. My trip would be ending soon; I would be in Istanbul in a week, then Frankfurt, then America. I wandered back to the hotel and began to repack the bike. 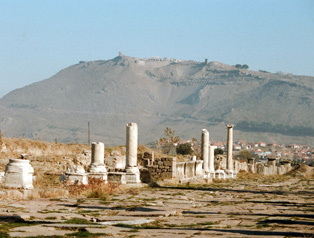 These are the lower ruins at Bergama. Up on the hill in the background are the upper ruins, Askiepion. 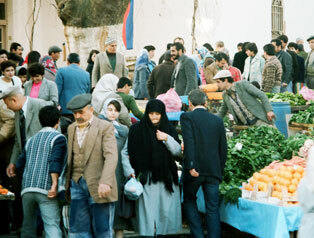 Turkish markets are colorful and crowded. I loved the Turks -- they were friendly, and proud. Watching me snap a few photos at the coal station, these folks demanded that I take a photo of them.